Good Morning Bloggers, I hope you all enjoyed your 4th of July celebrations in honor of America's 233rd Birthday. For those beyond our borders, I hope you enjoyed your weekend a well. 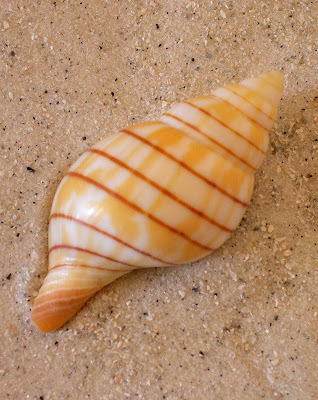 Here we are once again with another seashell to identify; name this shell correctly and you could win the mousepad of your choice from my Zazzle store. Remember whoever get the most answers right first in twelve weeks will be the winner. The competition is close, but there are still four weeks left, so name this shell and get in on the giveaway! Yes Pam, you're right! This is a Banded Tulip, home to black snails. They can grow to over four inches. They have delicate shells, so often they are found broken on our beaches. And the chicken mango wrap sounds delish!!! I wanted to comment on the beauty of that tulip shell, Rhonda. It's very unusual for me to see one of the orange ones, as what I usually find on Sanibel are the lavender ones. The surf further up on the coast must be stronger; I seldom see a broken tulip down here. A big hello from one beach lover to the other. Love your blog..
Meg, you are always a ray of sunshine when you visit the Hut; your wit always makes me smile. Welcome Aysegul, your blog Torquoise Diaries is so wonderful! I love seeing photos of beaches around the world and learning how people in other countries spend their time at the shore. The beach at Datça Peninsula in Turkey looks so inviting and I'd love to dive into those plates of calamari and french fries! Now for Chris and Pam — Game On! The points now stand at Pam – 4 and Chris –3. We have three weeks left and you guys are neck-and-neck. So, I leave it to you, how would you like me to post the remaining photos — randomly or at a specific time? I can have the post ready and hit publish at say 5pm, what do you think? This doesn't mean that someone else can't jump in make this even more interesting, but you two have been going back and forth and both obviously know your shells! Pam, I misspoke on how frail the tulip shells are, I had almost posted another shell (I know you guys know what it is) that is very delicate, and wasn't paying attention when I responded. Sorry, I admit my mistake and blame it on being tired from staying up past my bedtime to watch the fireworks the night before. The tulips I find here are orange, but I have a few small lavender ones from your area. I haven't been to Sanibel for years, but I'm planning a visit before the end of the year. Btw, I meant to tell you that I have the same palm tree plates you used for your chicken mango wrap.